Quick-freeze deep-etch image of rows of carrier vesicles lined up along the cytopharyngeal microtubular ribbons. These vesicles arise from early endosomes as clathrin coated vesicles and are about 100nm in diameter. Vesicles lose their coats before binding with the dynein motors that link them to the microtubules. They tend to lie on the anterior side of the ribbons along with the discoidal vesicles. Carrier vesicles eventually dock on acidosomes and fuse with these. Acidosomes are late endosomes. 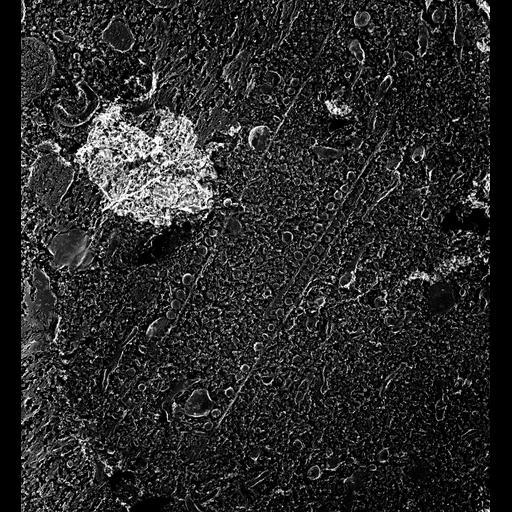 TEM taken on 5/24/88 by C. Schroeder with Zeiss 10A operating at 80kV. Neg. 12,000X. The raw negative was scanned with an Epson Perfection V750 Pro and this high resolution image is best used for quantitative analysis. Additional information available at (http://www5.pbrc.hawaii.edu/allen/). Small part published in J. Cell Biol. 111:2553-2562, 1990. Adapted with permission.